What was originally born as a solo side project for musician Chris Carrabba, Dashboard Confessional quickly grew to become one of alternative rocks defining standouts. The debut album, The Swiss Army Romance, became the soundtrack to a generation, with its heartfelt poetics resonating with fans who found solace in Carrabba’s sensitive yearnings and fearless honesty. Dashboard Confessional’s sophomore release, The Places You Have Come to Fear the Most, was the first to feature a fully-fledged band, with a spotlight on Screaming Infidelities, the smash hit that went on to earn the MTV2 Award at the MTV Music Video Awards amidst becoming the anthem of a generation. To date, the band have a RIAA certified platinum album, multiple gold albums and continue to release inspiring records, keeping alive the genre they helped to create themselves. Dashboard Confessional continue to sell out shows the world over, performing with the same high powered drive that earned the world’s admiration 17 years on. 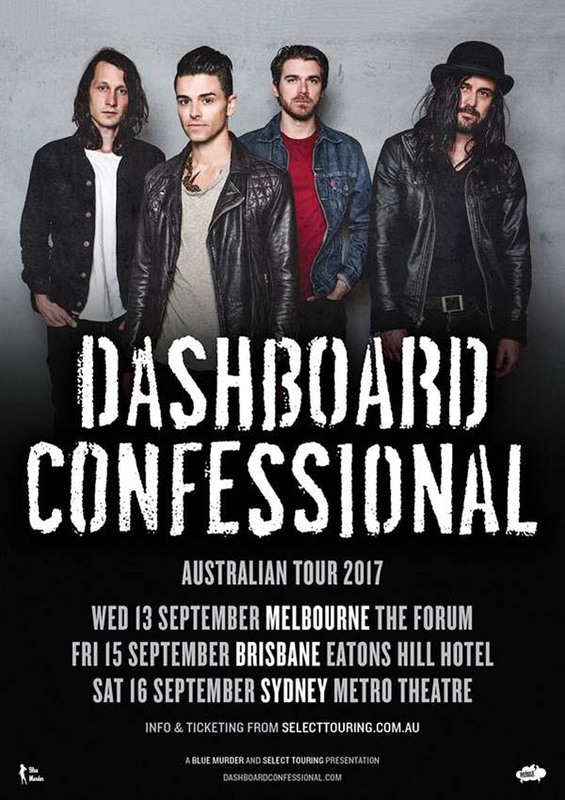 Dashboard Confessional return down under for the first time in five years. These are shows you don't want to miss! General public tickets on sale 9am Tuesday 8th August.